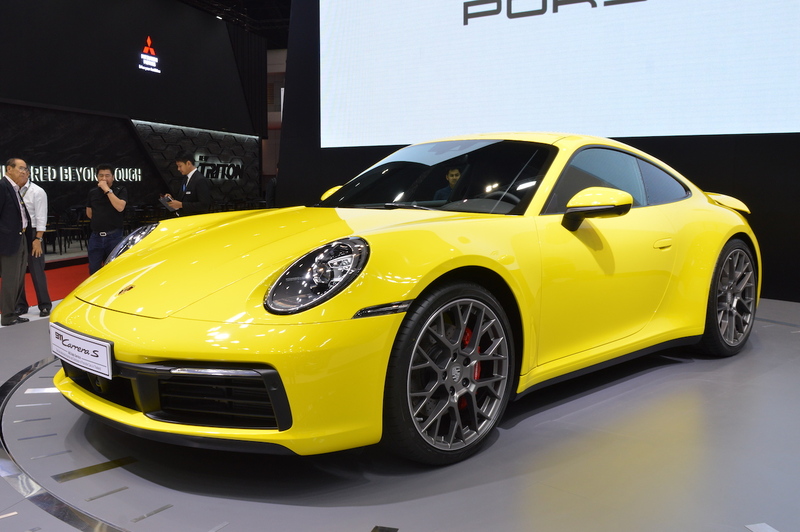 Porsche today launched the all-new 2019 911 in India, in Carrera S coupe and Carrera S Cabriolet variants. The coupe version costs INR 1.82 crore*, while the cabriolet version retails at INR 1.99 crore*. This is the eighth generation of the iconic sports car. Every new generation Porsche 911 has to look familiar, and the eighth iteration carries on that tradition in every possible manner. The all-new model is arguably one of the finest examples of evolutionary design. It’s wider, more assertive and superior in various aspects compared to its predecessor. The basic shape, proportions and most of the design elements have been simply enhanced, which is exactly what Porsche customers ask for. At the front, the redesigned model boasts LED matrix headlights each having 84 LEDs and a unique four-point signature DRL that extends backwards in a 3D form, and the forward-extended bonnet with a distinctive recess in front of the windscreen is a throwback to the earlier G series 911. Porsche has launched the all-new 911 in India exclusively in the rear-wheel drive Carrera S variant. Looking from the sides, too, the eighth generation model is unmistakably the Porsche 911 with a squat roofline. The wheelbase has remained unchanged, but the length has increased by 20 mm. That growth, combined with the 45 mm wider front axle and 44 mm wider rear axle, makes the sports car look even flatter, especially when seen from the front. The new electrical pop-out door handles emphasise the tapered and smooth side contour. The redesigned ORVMs have led to a minimised wind noise. The Cabriolet version features a unique panel bow convertible top made of lightweight magnesium. It can be opened and closed in around 12 seconds, at speeds up to 50 km/h. The roof can be operated by a button in the centre console, and even from outside, using the remote control. An integrated, electrically operated wind deflector ensures increased comfort at higher speeds. It can be opened and closed at speeds up to 120 km/h. The rear-end is undoubtedly the most striking angle of the all-new Porsche 911, with a seamless, elegant LED light bar that spans the entire width. The significantly wider, variable-position spoiler and the centrally located third brake light integrated into the air intake louvres and the turn indicators enclosing the continuous LED light strip are a few more interesting design bits at the rear. The model designation is inscribed in a newly created font that pays homage to the style Porsche used in the 70s. 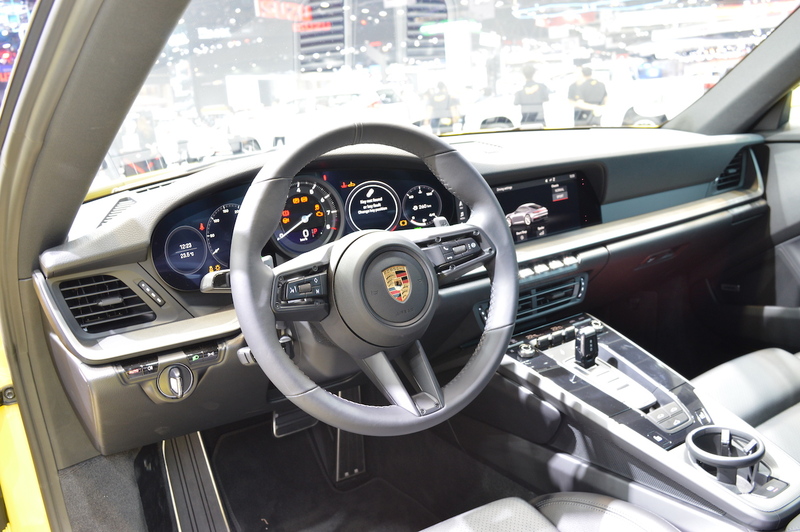 If there’s something Porsche has thoroughly revamped with the latest full model change, it’s the interior. Gone is the ignition key, thanks to passive keyless entry and push-button start. As expected from other recent all-new Porsches, the traditional analogue rev counter is now flanked by two fully digital displays. The adjacent new 10.9-inch PCM touchscreen infotainment system is flush-mounted, making the interior look cleaner. Directly below that, there’s a new switch unit with five buttons for easily accessing the key vehicle functions. 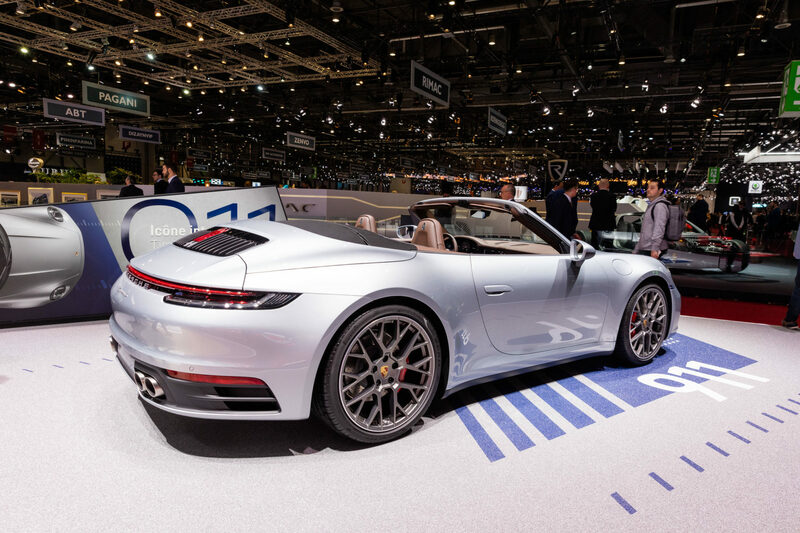 The 2019 Porsche 911 Cabriolet's roof can be opened and closed in around 12 seconds, at speeds up to 50 km/h. The 2019 Porsche 911 uses an outer skin made almost entirely out of aluminium, with the front and rear aprons being the only exceptions. Various such improvements in the name of weight reduction have been made. The redesigned model has a mixed tyre configuration: 20-inch wheels at the front and 21-inch wheels at the rear, with the latter significantly wider. In a world-first, there’s a new Wet drive mode, which can be activated using the toggle switch above the centre console. On opting the Sport Chrono Package, the Wet mode is included in the mode switch. The diameter of the rear brake discs has been increased from 330 mm to 350 mm, and the brake pedal ratio has been shortened. The steering ratio is more direct now, around 11% more in the standard configuration and approximately 6% more in configurations with the optional rear-axle steering. The new dashboard covers the entire width between the two horizontal wing levels, as was the case in the original Porsche 911. Porsche offers the 2019 911 with an all-new 3.0-litre twin-turbo flat-six engine puts out 450 PS at 6,500 rpm and 530 Nm of torque at 2,300-5,000 rpm. Power is delivered by a newly-developed 8-speed dual-clutch automatic transmission. A 0-100 km/h sprint takes 3.7 seconds in the Carrera S coupe and 3.9 seconds in the Carrera S Cabriolet. On equipping the 2019 Porsche 911 with the Sport Chrono Package, the 0-100 km/h acceleration time reduces to 3.5 seconds (coupe)/3.7 seconds (Cabriolet). The coupe can go up to 308 km/h, while the cabriolet maxes out at 306 km/h. The all-wheel drive 4S variant is unavailable in our market. Deliveries of the 2019 Porsche 911 will commence in July 2019.